Directions: On this worksheet, positive horizontal directions are towards the right and positive vertical directions are upwards. Question 1 What is the net force acting on a 6-kg mass if it is accelerating at a rate of 4 m/sec2? Question 2 What is the magnitude of the frictional force present if a 6-kg mass being pulled by a horizontal force of 7 newtons towards the right experiences an acceleration of -0.83 m/sec2? Question 3 A 6-kg mass experiences two vertical forces: 54.6 newtons pulling upward and 58.8 newtons pulling downward. What acceleration does the 6-kg mass undergo? Question 4 A 6-kg mass is being pulled towards the right with a rope that has a tension of 49 newtons at an angle of 44 degrees to the x-axis. 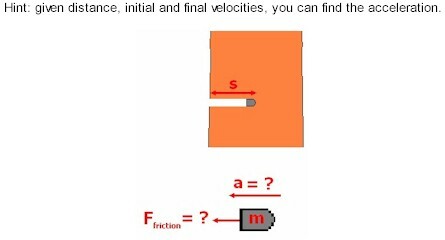 If the surface is frictionless, what acceleration will the mass develop? Question 5 A 14-gram bullet travelling at 70 m/sec is fired into a tree. If the bullet is brought to a stop in a distance of 44 centimeters, what average resistive force did the tree exert upon it?